There's a reason it's taken me forever to post an update about the Steelhead 70.3 Triathlon on August 1: I cannot finish my race report. I'm partially to blame as I'm always psyched to write reports about good races and less-than-thrilled to share the bad ones. And while we all dealt with the weather conditions that definitely affected my racing day, there was more to what I like to call my downfall than that. So while I'm still finishing up the play-by-play, here's an abbreviated version. *Good dinner the night before with my parents at Timothy's in Union Pier. *Having my parents watch me compete, especially since my husband was stuck in Chicago on call and no one would trade shifts with him (which also falls into the not-so-happy category). *The swim wasn't canceled this year. Hooray for not running 2 miles, then biking and then running 13.1 (my legs really didn't like that last year). *Knowing several people who were also racing. My gym had really good representation, especially the Thursday night spin class, which also meant I didn't have to walk the 1.2 miles to the swim start by myself. *Body surfing in the water. We had gentle waves building in Lake Michigan as the morning wore on, and if you caught them right you could surf across them, making the long swim go by just a little faster and more fun. *The post-race party. OK, so it's not really the party because a local Benton Harbor restaurant does host an event for athletes after the race, but the finish line atmosphere is a fun one. After you've received your medal and had your chip clipped, you don't want to exit the athlete-only area right away. There are chairs to relax in--and they're undercover--kiddie pools filled with ice-cold Gatorade, soda and water, and tables that start looking like the Farmer's Market I was missing at home, filled with fresh peaches, nectarines and plums. Delish after chomping down on mushy bananas and Sport Beans on the course. And that's not even counting the Pizza Hut buffet that awaits after reuniting with your family outside the athlete-only zone. It sounds grossly unhealthy and yeah, it kind of is since you can beg volunteers to keep piling pizza, chicken, burgers, pasta, and garlic bread and breadsticks onto your plate, but it's oh so good upon finishing. And after a painful bike and run (more to come on that), it was well deserved too. *Ideal water temperature. Lake Michigan can be finicky in terms of its temperature. Take the chilly temps hovering around Racine for the 2008 Spirit of Racine--I froze in 56-degree water--and again in 2009 where it measured 59 degrees the day before the race. I never heard the water temperature in Benton Harbor but it wasn't a brace-yourself-it's-cold day and the water felt pretty good. *The volunteers at these half Ironman races are amazing. I didn't really pay attention to them on the bike because I carry my own fuel and can't grab a bottle while riding (definitely a skill I need to work on), but on the run they were plentiful and with the exception of one bad choice on my end they were always stocked with cups, sponges and food. Thank you! *The cops stopping traffic at the major intersections. I sound like I'm whining but I swear I had a close call with a car last year at the race. I'm riding my bike past an intersection and a cop has instructed a car to pull out onto the main road, but the car looks like it's about to plow into me and the guy who's about to pass me instead of making a tight turn and going into the far lanes. Talk about scary. But at least I wasn't put in a similar situation this time around. *Having relatively the same run course as last year. I like signing up for the same race year after year so that I can gauge improvement--or lack of--and get more familiar with the course. And while the 2008 course was different from the 2007 one with an added hill that we had to run up twice, everything was the same this time around. *Me. I'm thinking I wasn't recovered from the Racine race, or what I thought was taking it easy for that race was really harder than planned. I just had more than my fair share of disappointment for the day. *The close quarters of the transition area. We were so cramped walking the rows of transition and the bikes seemed really close together. Sure, there are bags and more people in the tight quarters before the race, but it was just as bad during the race, especially coming in from the bike. I was hopping over wetsuits that got tossed into the aisle and carefully making sure I didn't swing my bike too close to the bikes already racked. Kinda crazy. *The pain on the run. Again, this all goes back to me and issues my body was having. My left foot was numb when I started out on the run--that was a new sensation, and not a good one--and then it went to heated pain where my heel felt on fire. That was the plantar fasciitis talking. And that's not counting the issues my right leg was giving me--it just hurt to run and you couldn't ignore it. *The wind, the wind, the wind. Talk about a strategy going awry...I usually go a comfortable pace to gain my bike legs and then throw it into high gear for the back half. But as we turned onto highway 63 for the long stretch home, we were met with a wall of wind. Ugh, and all you could do was watch the speedometer slip, hold on tight--I swear I was going to get thrown on some of those gusts--and watch the bike time take longer than planned. And while some people said they felt a tailwind earlier, I always thought the wind was blowing around me. *The path to the bike in area. There was a new twist to get to the bike dismount area. The bike route was mixed up a little this year and in my opinion, not exactly for the better. Instead of turning off the highway, then one more turn before the bike dismount line on a wide road, we had to pull off the highway, turn onto a foot path and pedal--or more like wind because you really couldn't go fast--past lines of spectators, and then dismount. It was a little hairy and I'm an early unclipper and had to clip in and out so I didn't topple over on the turns, and it was nervewracking riding past so many onlookers while in what I called a caution zone. *Cars on the road, especially a white, beat up Bonneville. 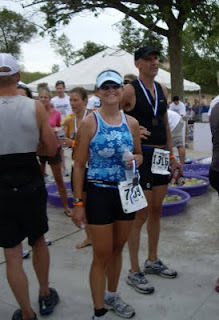 While many people complained about drafting at my other half Ironman, Racine, it didn't really affect me except to discourage my speed (or lack thereof) when a pack would go by. This time the drafting was at a minimum, if at all, but there were cars on the road that were getting in the way. I can totally understand the impossibility of having a 56-mile route completely closed to traffic but when a car gets in your way and won't pass you and you can't pass it--yes that's the Bonneville part--it gets incredibly frustrating. And he gave me the finger as I struggled to figure out a way around him. I think he was attempting to pass a slower cyclist in front but there was no oncoming traffic yet he didn't move over and blocked those of us--OK, maybe just me--approaching from behind. Talk about full speed ahead when I could finally pass. And then it happened later where a red minivan was driving down the road ahead of me. It never got in my way but it looked like it tripped up a few people, maybe even caused a woman to ride off the road, lose her balance and have to get back on her bike. *The rain. It's always nice to hang out at the beach, enjoy the pizza buffet and then slowly head back to transition, pack up and go home. Rain was on its way and fast at the finish. By the time I left the athlete-only area, talked to some friends and got in line for the pizza buffet, it started to sprinkle and then just flat-out rain. So the leisurely post-race atmosphere turned into a chow down, a hustled limp to transition to shove gear into a bag and then more shuffling to the car. kate! if you do a tri out here on the east coast, i'll come watch! and you can have a place to stay right on the hudson (we move in this saturday!). got that? haha, thanks vee. i'll have to start checking east coast calendars. I'm thinking of doing a race in rhode island but that's not exactly close. good luck with the move! or is it settling in?